NASHVILLE, Tenn.—“Sound of the Saints,” the latest single from GRAMMY® Award-winning FairTrade Services recording artist Audio Adrenaline, officially released to Christian radio formats last month on the heels of multiple early adds from key stations around the country. An enhanced arrangement of the title-cut from the band’s best-selling 2015 project, the single features the His Little Feet International Children’s Choir and is now available with the album at digital retail. The FISH Los Angeles; Baltimore’s Shine FM; American Family Radio; WDJC in Birmingham, Alabama; Ft. Wayne, Indiana’s Star 88.3; and WFRN in Elkhart/South Bend, Indiana, are among more than 30 stations already playing “Sound of the Saints.” Co-penned by Audio Adrenaline founding member Mark Stuart and current lead vocalist Adam Agee, along with Seth Mosley and Jared Anderson, the song was largely inspired by the band’s Hands and Feet Project—an organization they founded in 2004 to help orphans and children throughout Haiti. "Sound of the Saints" will also be featured on the big screen, showcased in the opening of the highly-anticipated April 1 Pure Flix release, "God's Not Dead 2," as well as on the film's official soundtrack releasing March 18 from FairTrade Services. 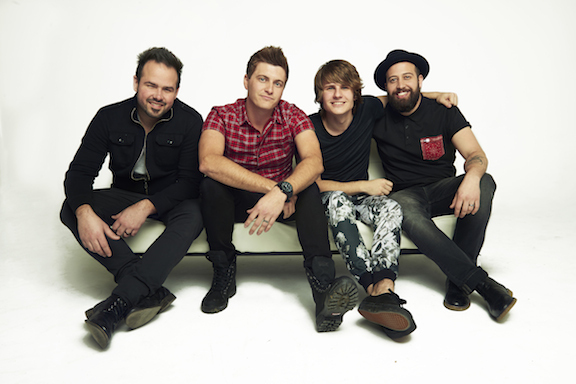 Additionally, fans around the country can hear Audio Adrenaline perform “Sound of the Saints” as part of the 2016 Rock & Worship Roadshow, kicking off February 4 in Springfield, Missouri. The tour, headlined by Newsboys, will hit a total of 28 cities before concluding March 20 in Mobile, Alabama. "To collaborate with Adam and the guys on ‘Sound of the Saints’ was a blast creatively, but the true blessing is in using the song and the Audio Adrenaline platform to fight for the cause of Haiti's orphaned and abandoned children,” says Stuart. “I'm stoked to see the guys perform it on the Roadshow with the kids from the Hands and Feet Project backing them up on the video wall." Sound of the Saints debuted at #1 last year on Billboard’s Top Christian Albums chart. Produced by GRAMMY® winner Seth Mosley (Jeremy Camp, for KING & COUNTRY) and Joshua Silverberg (Newsboys, Michael W. Smith), the project builds on the pop/rock foundation and lyrical themes which have hallmarked Audio Adrenaline’s iconic repertoire for nearly three decades.